We have been having some beautiful fall weather lately and I've been spending a lot of time outside enjoying it. It has been cool in the mornings (50's), warming up to the mid to high 80's in the afternoons with lots of sunshine and clear, perfect, blue skies. It reminds me again why I live in Oklahoma...something that has been rather hard to remember with all the other freaky, rainy, yucky weather we have had for so long. We had a mild thunderstorm early this morning, the kind that rumbles through rather quickly and makes you feel good about being snuggled deep in the covers of your bed. It was gone by 7:00 a.m. and the sky cleared by noon, revealing another perfect day. I love sitting outside reading a book, trying to keep Zoe from eating worms, caterpillars, bugs, and watching her watch the squirrels in the pecan tree. All in all, it's been a quiet and restful day. I ran errands while the sky was overcast and have enjoyed the afternoon sun. I hope you have had a very restful and fulfilling Saturday as well! Forgive me, but a friend sent this to me and it is too cute to keep to myself...snicker! Halloween is just around the corner. 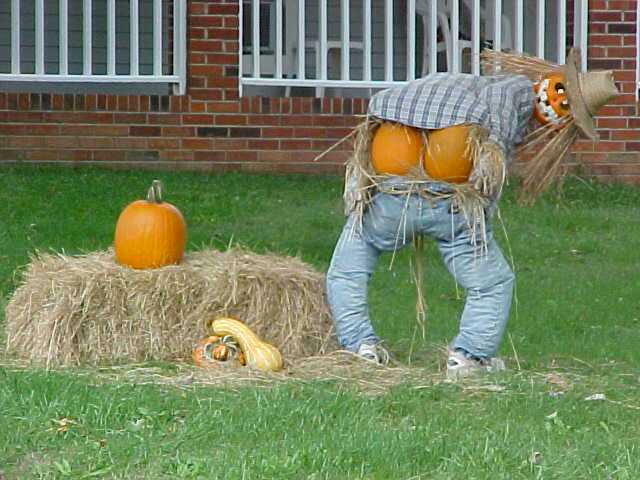 How many of you have ever been mooned by a scarecrow? Now, you have!!! Doesn't that get you in the mood for Halloween? Gads...where does the time go!!!??? Seems like no matter how hard I try, I just can't keep up. This past week, I've been sick, which has put me even further behind than usual. I've had some kind of intestinal bug that kept me home from work the last couple of days. No fun! Well, no fun for me. Zoe has loved it. She loves having me home, even if I'm jumping up rather frequently making a run for the bathroom. She doesn't make it easy, by the way. She is a real snuggle-baby...I think I've mentioned that in the past. Now that the weather has gotten cooler, she doesn't just want to snuggle up as close as she can get next to me, she wants to sleep on my stomach! Yes, that's right. On. My. Stomach. Right on top. I don't know if you've ever tried to sleep with an almost 14 lb. Schnauzer laying on your stomach, but it's NOT easy and not particularly comfortable. That's a lot of weight when it's all bunched up on a rather sensitive area (and it's been even more sensitive this past week). Also, trying to remove said 14 lb. Schnauzer from said stomach when said Schnauzer is total dead weight can be somewhat problematic when one is trying to make a mad dash for the bathroom. It's probably been rather comical, viewed from the outside. I'll try to remember that...later...when I'm not still in the middle of the comedy. You would think she would get tired of me launching her off of me unexpectedly, considering how tired I am of having to do the launching. But it doesn't seem to faze her. She climbs back up each time like it's not big deal. Turns around a few times...oof...ouch! Settles down. Smacks her lips. Closes her eyes. Sighs. Sleeps. Maybe having a dog's life wouldn't be such a bad thing. Doesn't take much to make her happy. As long as she can be with me, she's content. A little food, a little play time and just hanging out with "mom" makes for a good day, even if "mom" is sprinting for the bathroom every few minutes. I have a feeling I could learn something from her, if I could just figure it out. But right now, I'm heading for the bathroom!!! Nail polish is such a funny product. It amazes me, really, how easy it is to chip, considering that it is a fairly hardish kind of paint. I seem to constantly chip my nails, no matter how careful I am, no matter how many layers of top coat I use. I get these little dings in my paint job just because I live and breath. So please explain to me why it takes 22,343 lbs. of pressure and two hours of hard labor along with a nasty smelling chemical that you can use to clean your toilet (and it does a better job that toilet cleaner) to REMOVE this very same nail polish that chips on contact with soft clothing?